Come in and take a look around our hobby shop � you�ll see state-of-the-art equipment and tools of all types. And check out the cabinets, workbenches and stools, all built by the dedicated group that gets together every weekday morning to cut, drill, pound and paint. Got a flamingo with a broken beak? Or a tiny table that teeters? Bring it in...the guys will tell you if it�s fixable. Costs are minimal and all monies collected go back into the kitty to buy new supplies. The hobby shop builds all of the props, scenery, and backdrops for in-house theatre productions. These pieces are used again and again; occasionally certain props are donated to the City of Plantation for use in their recreation programs. Our library has been outfitted with bookcases built by the shop...as more books come in, more shelves are needed. And the audio/visual team has requested a new set of shelves, which are already in the painting process. Outside, the shuffleboard players appreciate having the wooden benches to sit on between turns. 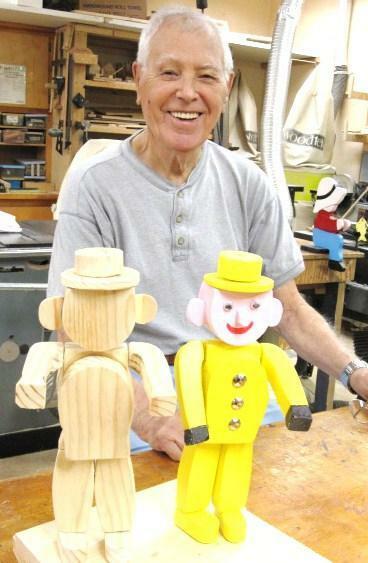 Each year, just before the holidays, the group donates a big batch of wooden toys to the Plantation Historical Museum . 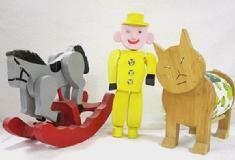 These toys are handed out to school children who tour the museum during school break. So, make a point to stop in and say hello...they�ll be glad to tell you more about all they do! Our hobby shop is a fully equipped woodworking shop with a group of great guys and gals. Stop by any weekday 9am to Noon in the main clubhouse.